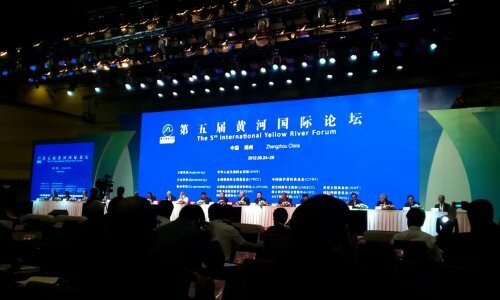 The 5th International Yellow River Forum (IYRF) was held in Zhengzhou, capital city of Henan Province in north-central China from September 24 to 28, 2012, under the theme “ensuring water right of the river’s demand and healthy river basin maintenance”. Jun TIAN, person in charge of the Chengdu Pole of the China-Europa Forum (CEF) and Secretary General of the Chengdu Urban Rivers Association (CURA), and Denise LAI, Project Manager of CEF, were invited to attend the meeting. The five-day water conference included two summit meetings- Water Leader Summit and River Dialogue, and five thematic sessions- Integrated River Basin Management, River Health and Environment, Climate Change and Adaptive Water Management, Tools and Technology, and Water Governance and Stewardship. 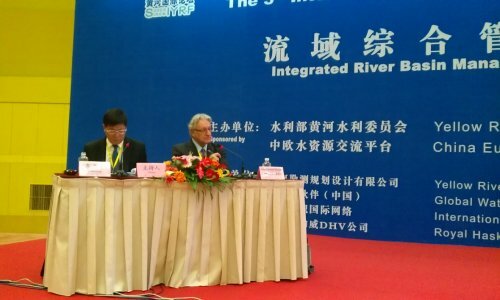 Within the framework of CEF, the Yellow River Conservancy Commission (YRCC), a long-term partner, established workshop T52bentitled “Integrated River Basin Management” with European counterparts. Mr Jean François Donzier, European participant of T52b and Director General of the International Network of Basin Organizations, chaired the first thematic session-Integrated River Basin Management. Since CEF’s initiation in 2005, two workshops related to Water Resource Governance have been created. One is T52b, and the other is T52c - Promoting Eco-hydrology for the Sustainable Management of Ecosystems and Water. Frequent natural disasters, extreme climate change, ecological destruction, basin flood and drought, urban water-logging, water shortage and pollution are becoming increasingly alarming. Therefore, CEF lists Water Resource Governance as one of key strategic themes to be covered in future, aiming to bring together more experts, scholars, practitioners and innovators from China and Europe to discuss and distribute to this field.